The original movie, “A Christmas Story” usually resonates with fans on an emotional level. Maybe they grew up in a simpler time like the ‘40s in which it is set. Perhaps they recognize themselves in Ralphie, in his Christmas season long desire for the perfect present (a red Ryder BB gun.) Maybe they see their parents in the patient mother or blustering father. For this reviewer it is a little of all that, but also the fact that the first official date with my (future) wife was to see the film in the theater one late November day. The younger performers steal the show, with Tristan Klaphake as the bespectacled and often frustrated Ralphie, Evan Christy as his little brother Randy, and a whole chorus line of fellow students, bullies and friends who lament how difficult life can be “When You’re A Wimp.” During the big showstopper, “You’ll Shoot Your Eye Out,”, Wyatt Oswald, has a surprising specialty tap number. But the adults get to kick up their heels as well, in numbers like “A Major Award”, featuring the predestined parade of plastic leg-lamps. 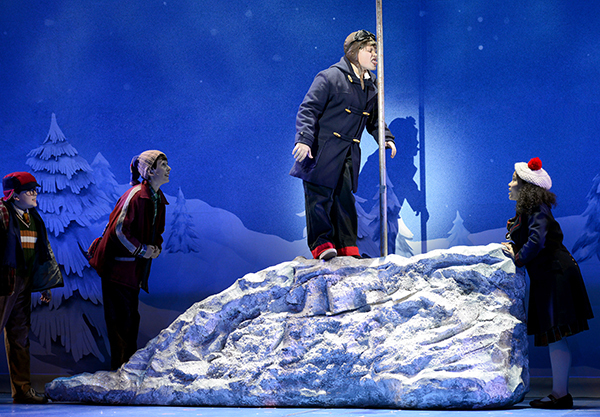 “It All Comes Down to Christmas” sets the stage early on that this show is all about bringing smiles to the faces of children and adults alike. . .even if they don’t wind up marrying the girl they came in with! To open the second “Masterworks Series” program of the HSO’s 74th season, Music Director Carolyn Kuan selected Berlioz’s lively “Corsair” Overture, conceived in 1831 but not definitively completed until 1852. The orchestra gave it a fiery rendition, strings, winds, and brass all contributing mightily to the excitement. The concert continued with the last and what is considered the greatest of Mozart’s five violin concertos, all written in 1775 when he was 19 years old. 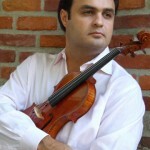 Nicknamed the “Turkish” concerto for an exotic-sounding interlude in the finale, it featured as soloist HSO concertmaster Leonid Sigal, whose silken tone highlighted the classical elegance of the piece. He and a reduced-size orchestra took all three movements at a leisurely pace, giving the opening “Allegro aperto” an expansive grace, the “Adagio” a timeless calm, and the closing “Rondo” the quiet poise of the “minuet tempo” that Mozart called for. Intermission was followed by a dramatic account of Debussy’s “La Mer,” or “three symphonic sketches” about the sea, which he wrote between 1903 and 1905, inspired by his lifelong fascination with the ocean. The masterful balance Kuan achieved among all sections of the ensemble allowed many details of colorful orchestration to be heard, from the glistening glockenspiel to two sweeping harps and three stentorian trombones. Tension never slackened, and the volatility of the waves and the wind were vividly portrayed. Publicity for this program of three concerts had promised a “surprise encore selection to be announced.” This turned out to be Ravel’s “Alborada del Gracioso,” or “Morning Song of the Jester,” whose slow middle section, Kuan noted in droll introductory comments, depicts lovers reluctantly awakening to another day. The brilliant HSO performance evoked the flair of Berlioz, the refinement of Mozart, and the panache of Debussy. Besides showcasing her concertmaster when she could easily have hired a guest soloist, another example of the personal touch that endears Kuan to HSO audiences was her dedication of these Veterans Day weekend concerts to local veterans and her invitation for all veterans present to stand and be acknowledged. This new American maestra is indeed a class act. 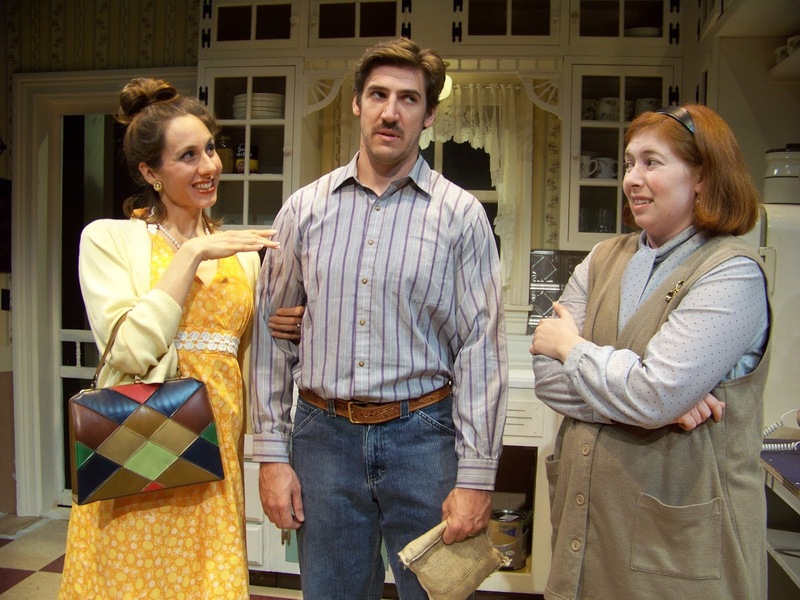 The Majestic Theater’s “Crimes Of The Heart” delivers a performance of comic chaos as the three Magrath sisters – Babe, Lenny, and Meg – attempt to resolve not only their personal crises, but also their very public dilemmas. These trials and tribulations range from insecurity, guilt and sibling jealousies, to infidelity, home wrecking and attempted murder. All elements are makings of a fine family reunion. Set in a small town in the deep South in the 1970’s, the sisters’ miss-adventures make them the talk of the town, and draw the uninvited meddling of folks like Chick Boyle, an intrusive and highly opinionated relative with more than enough to say about each of their circumstances. Attempting to stabilize their topsy-turvy world are the legal efforts and simmering romantic inclinations of young attorney, Barnette Lloyd, who, himself, has some ulterior motives in taking on the defense of sister Babe. Then, there is the married old flame of another sister, whose presence has free-spirit Meg aglow. Add to this, two never seen characters who agitate the sisters’ days and nights from their respective hospital beds: old Grand-daddy, the family patriarch, hovering between this world and the next; and Babe’s gut shot hubby, who has unresolved anger control and legal issues galore. The cast, under the direction of Cate Damon, adeptly carry off the careful balance of comedy and human drama needed when mixing scenes of the hilarity of donning ill-fitting pantyhose, and those of the genuine trauma of abuse. Set designer Greg Trochlil provides a warm and intimate setting for all these tail-spin tales to be resolved. There are more than enough laughs to be enjoyed in this story of three sisters learning how to survive crimes of the heart. It’s not often when the full program of any symphonic performance focuses solely on American composers. Without hesitation, Springfield Symphony Orchestra’s “Viva America” was one of the finest evenings of music in my memory. Bravo to Music Director Kevin Rhodes and SSO staff for selecting four pieces of accessible music which created such an evenly balanced array. If a stranger on the street was quizzed on the names of three of the top 10 famous American composers of all time, surely the list would include George Gershwin, Aaron Copland, and Leonard Bernstein. The skills of each are amazing unique, and within a few stanzas, most in the audience can easily recognize the signature style of these great talents. Gershwin’s piece provided a short journey out of the country for “Cuban Overture.” Picture “American in Paris’” allure of flowing refrains to background sounds of castanets and tambourine. Perhaps a strange, yet perfect mix. For a complete change in direction, yet also with undeniable Spanish charm, was Copland’s “El Salon Mexico.” Images of Copland compositions evoke America’s wide open west of old with heroic cowboys. This was a fun piece for audience and performers alike. Relatively young, new, unknown, American composer Lowell Liebermann’s “Cello Concerto Op. 132” was the challenge of the evening; challenge in the sense that 21st century audiences generally do not want to hear contemporary music for full orchestra. The second challenge was the cello as the solo emphasis – not my personal favorite string, and I think that I am not alone. 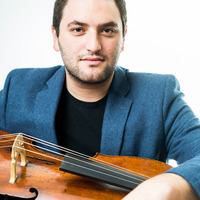 Special guest Julian Schwarz, celloist – also young yet with a long list of accolades since age 11, took on the third challenge as he interpreted Liebermann’s lengthy work. In a short prelude to his performance, Schwarz informed those seated at Symphony Hall that they were about to hear something, “mesmerizing.” That word was the perfect adjective to describe both the music and the musician. Schwarz received an instant mid-concert standing ovation. Leonard Bernstein’s “Symphonic Dances from West Side Story” was the finale; a gift to the audience. Many of the recognizable songs from the musical/movie flow from one to another, with emphasis on the dramatic, cacophonous, and rocket-speed “Mambo,” “Jet Song,” and “Cool.” Special kudos to the percussionists. At the conclusion to Bernstein, Conductor Rhodes never looked more pleased and proud of his orchestra. He was beaming. I read program books. I would guess that most audience members do the same. However, I read every page, even the list of donors – well, not quite all the names. Unique to “Rags” is its pages of actors, complete with the usual photo headshots and a paragraph on each. However, at the end of each description appears a line stating the nationalities of each actor’s roots, where these individuals immigrated from; i.e. Ireland, Poland, Lithuania, Hungary, the Philippines, Italy, Australia. In other words, just about everywhere. What a thoughtful extra on the part of Goodspeed’s playbill staff to provide this information, so apropos to the subject matter of “Rags,” not to mention suitable to 21st century America. “Rags” is the story of Rebecca, a young Jewish woman from Russia in the early 1900’s. Yet, “Rags” is everyone’s story of those journeying to the United States for a new life. Rebecca is a strong woman, gutsy, perhaps a little ahead of her time. Her interaction with her surrogate family, neighbors, two suitors, and most of all her young son show the audience a woman who must survive poverty, uncertainty, and responsibility all alone. Samantha Massell, gives her character gentleness and grit. She appears in nearly every scene, but never seemingly like the “star.” She “plays” well with others, and sings even better. What a superb soprano voice. It’s difficult to find a flaw in any of the actors. The camaraderie of new found “sisters,” the reunion of father and daughter, and the excitement of three romantic couples is the groundwork for “Rag.” Throughout, the orchestra murmurs refrains of klezmer music alternating or mixed with honky-tonk jazz. 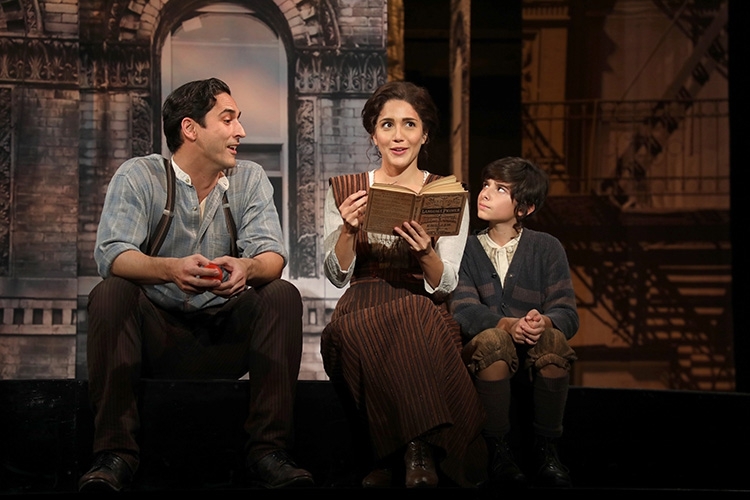 The musical is long, with many characters. Actors often double roles. A beautifully quaffed and dressed quintet, primarily representing Yankees, weave in and out of scenes making it clear that immigrants are not wanted here. Director Rob Ruggiero (whose talents are seen at TheatreWorks and Barrington Stage) and Scenic Designer Michael Schweikart have obviously worked hand in hand, blocking the actors on the turning circular stage where most of the story takes place. The success of “Rags” lays in what it is not. It is not a star-studded cast, the audience doesn’t “oh” and “ah,” there is no stopping this tale from telling the truth. Never does the audience think, “Okay, I’m watching a play now.” Instead, on some important level, “Rags” is a story of all of us. 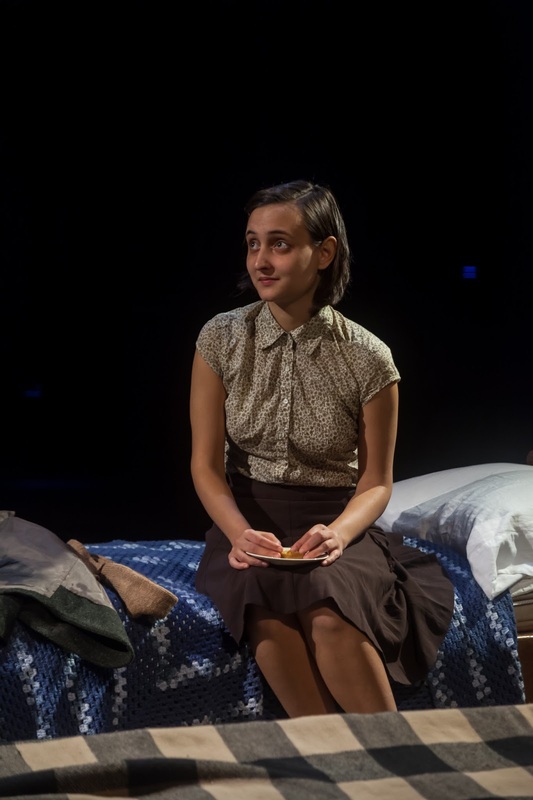 Multiple rooms on two levels, a loft, stoves, table, sink, six beds, dining table and chairs, are all on view to the audience as they enter Playhouse on Park for this superb production of “The Diary of Anne Frank” – making the claustrophobia apparent even before the play begins. The Frank and Van Daan families shelter here for over two years in their doomed attempt to avoid Nazi persecution. Concentration shifts quickly from the set however, when Anne enters. Isabelle Barbier, a -mature 26-year-old, is perfectly cast. She captures the voice, motions, and physical presence of the 12-year-old who enters the annex, as well as the maturing adolescent who struggles with the emotional and hormonal changes that soon follow. As Otto Frank, Frank van Putten embues his character with qualities ranging from calm, gentle authority to the optimism his family needs to maintain their own sanity. The Van Daan couple are played by Lisa Bostnar and Allen Lewis Rickman. 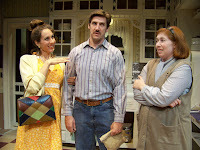 Through their occasional quarrels that shock the quiet Franks, these actors are able to show both the complexity of their own despair and their conflicted attachment to each other and their son, Peter. Dussel was a dentist who joins the families later, and is ably played by Jonathan Mesisca. Alex Rafala as Peter Van Daan, becomes Anna’s focus as her adolescence begins. He has also become captivated by her, and in the most touching moment of their connection, affirms her with “You’re pretty”-- how one hopes Anne might have heard those words from a “beau” this one time. Edith Frank’s worry and desperation for her family are beautifully portrayed by Joni Weisfeld, and Ruthy Froch confidently presents Anne’s sister Margot as the quiet, well-behaved foil to Anna’s ebullience. A Hanukkah celebration cements the work of this fine ensemble, when all seem to let the holiday help them accept their pseudo-family arrangement. Joel Abbott’s sound design puts a sudden and shocking end to the joy, and his contributions throughout the play enhance the atmosphere and the foreboding. The director also “staged” the intermission in a way that hammers home the theme of boredom in confinement. The play now ends with a monologue by Otto Frank that details the horrific fate of his family after the Nazis have seized them. In a talkback after the performance, we learned that this was one of Wendy Kesselman’s changes to the original 1950’s script. By his own account after the war (he was the only survivor), Otto Frank had twice requested – and was refused - United States asylum for his family. The red plaid diary became his focus for the rest of his life, and has been read by 30 million people.